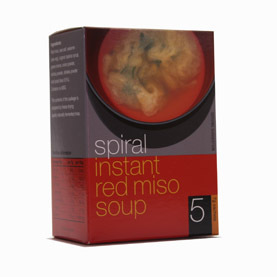 Spiral Foods’ Instant Miso Soups are made from naturally fermented soybean paste (miso) that has been freeze-dried, then blended with Wakame (sea vegetables) soup come in sachets and are easily prepared by simply adding boiling water. Organic Instant Miso Soup: Organic brown rice miso (soybeans, brown rice, salt, koji seed), organic barley miso (soybeans, barley, salt, koji seeds), wakame, kombu. Red Miso Soup: Red miso, sea salt, wakame, organic tapioca syrup, green onions, onion powder, kombu powder, shiitake powder, yeast (less 0.5%). White Miso Soup: Shiro miso, sae salt, wakame, organic tapioca syrup, green onions, onion powder, kombu powder, shiitake powder, yeast (less 0.5%). ANU Food Co-op, Instant, Snacks, Soups, SupaBarn. Bookmark.